I am not a major fan of creamy desserts but some Indian desserts definitely are exceptions. I find most of these to be a bit tedious to make at home, but kheer is probably one of the simplest. Although it is time consuming (since the milk has to reduce), it's totally worth the effort. 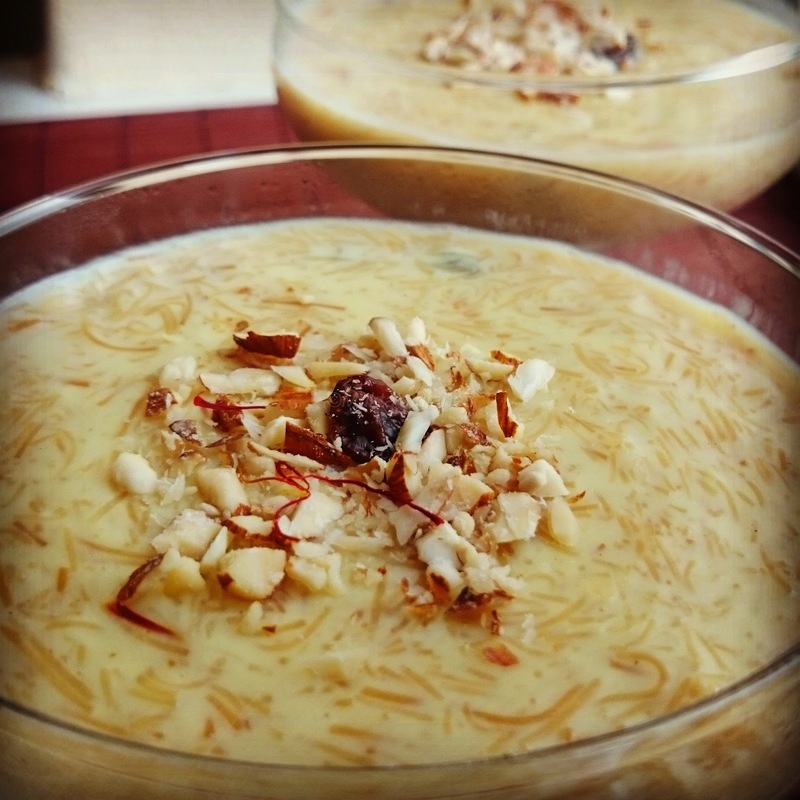 You can make kheer with rice or sago too but seviyan or vermicelli kheer is our favourite. The kheer we made today turned out so well, we just couldn't stop at one bowl! Melt the ghee in a nonstick, heavy bottomed pan. Add the raisins and fry for a couple of minutes till they plump up a bit. Add the vermicelli and fry on low heat till it turns light brown. Add the milk and turn up the heat to a medium high. Once the milk comes to boil reduce the heat slightly. Boil the milk until it reduces to almost half, about 20-30 minutes. Make sure to stir often so that the milk doesn't stick to the bottom and burn. Scrape the sides of the pan occasionally as well. Add the sugar, saffron, cardamom powder and almonds. Leave some almonds and saffron strands for garnishing. Let the kheer simmer over low heat for about 5-7 minutes. The kheer thickens as it cools. Garnish with the almonds and saffron strands. Serve it hot or cold. I personally love it chilled. Yum!